The 2018 event consists of a number of serial evaluations. The 2nd run of the NRW-Cup, being the start of the season for many athletes, will surely not be the easiest. The former route of the German Cup 2015 will demand a great deal of the athletes. 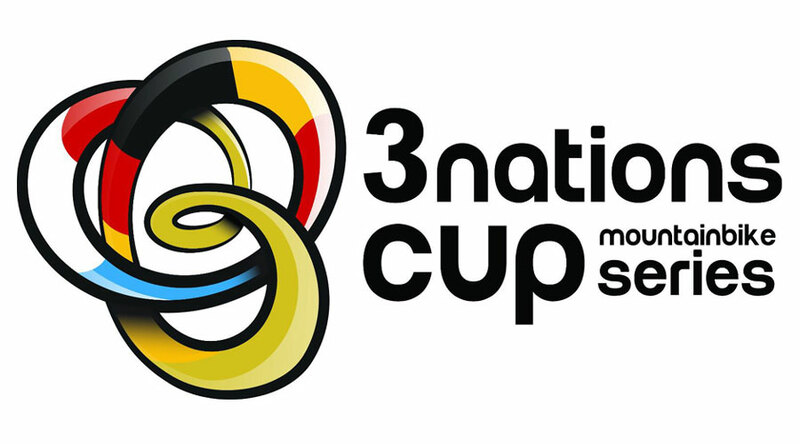 At the same time, this is the 3rd run of the 3-Nations-Cup, the international series of races in Belgium, the Netherlands and Germany. This series contains 10 international races in the category C2, C1 and HC, and it is surely going to gain in importance in the next years. The races for the 3 Nations Champion will take place in Saalhausen in 2019. These are from the total of 3 best drivers of the countries Belgium, Netherlands and Germany in the classes U17m, U19m, U23m, Master 1, Master 2, Master 3-4, Elite, U17w, U19w and Women determined. Athletes from other countries can not participate here. However, also the younger athletes will not be missed out. The Pontax Nachwuchs-Cup (a competition especially for the younger athletes) focuses on the technical realization and at the same time the speediness of the young bikers. Saalhausen will be their start of the season, too. They will ride a shortened track. The youngsters, Kids and Bambini will perform their sprint in a loop around the sports field and through the Bike-O-Drom of Saalhausen. Here you will find the most important information on the races. Registrations have to be made online on the registration system of Time&Voice until 11:59 p.m. of 09th April 2019. A later registration is possible until one hour before the race starts, but you will have to pay a special fee for it. For the fees, please take a look at the time schedule. If you have any questions, please ask our registration office. Minor athletes need the approval of their parent or legal guardian. Please print the form, fill it out and bring it when you pick up your start number. 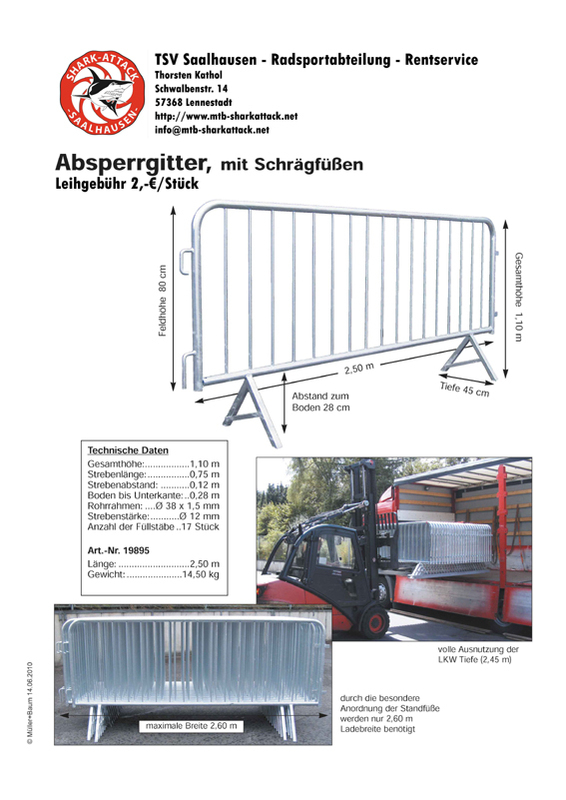 For all federally announced races the terms of competition of the Bund Deutscher Radfahrer e.V. (BDR) are valid. For all internationally announced races the terms of competition of the UCI are valid. Download: "Technical Guide"
Here you will find an overview of the trails for the different races during the Shark Attack Bike-Festival. You will find a summary of all times, meetings, fees, age groups and lots of more information in the time schedule. The start will take place next to the Kur- und Bürgerhaus Saalhausen. Please be there in good time previous to the start at the meeting point. You can pick up your start numbers in the Kur- und Bürgerhaus. Please use the main entrance of the hall and follow the signs. The deposit fee for the start numbers is 10 EUR respectively the license. The starting lineup will be determined by the commission council. It is made up of the series ranking list and the position in the world ranking. Please have a look at the time schedule for the times of the award ceremonies. Stay next to the Start/Finish area and follow the instructions of the hosts. The first three positions of each age group will get a special event trophy. The current results will be noted as soon as possible at the Pick-up-Point of the start numbers. Please check your result within a 30 minutes period for objection. Furthermore, the results will be available online at Time&Voice after the event. Online certificates are available for all classes on the Time&Voice online page. Only in exceptional cases, it will be possible to print certificates directly. The prize money has to be collected directly after the award ceremony at the pick-up-point of the start numbers. Prize money is given due to the announced race categories according to the WB/MTB of the Bund Deutscher Radfahrer respectively according to the UCI rules. A later pay-out will not be possible. The athletes and viewers are responsible for themselves and their action in every situation. The organizer excludes liability for damage resulting from the athletes or viewers or another third party. Each athlete has to be insured sufficiently. It should be a matter of course that everybody always shows a fair sportsmanship. During the races on Saturday and Sunday a number of physicians and general practitioners, supported by the Malteser Hilfdienst, will be on the spot. There will be signs to find the separate room for medical treatment. It is absolutely necessary to follow the parking signs. You will reach the area of the event within a 5 minutes walking distance. If you are looking for a possibility for a sleepover in Saalhausen or in the neighborhood, please contact our tourist information. Camping is possible right next to the area of the event. There will be signs. Anyway, please note that water and electricity are limited there. 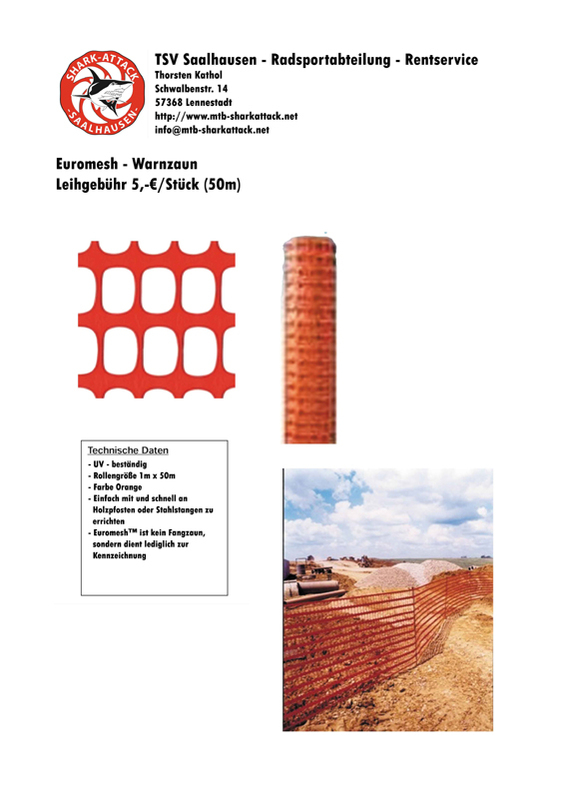 Please look for accommodation on www.saalhausen.de or www.lennestadt-kirchhundem.de. 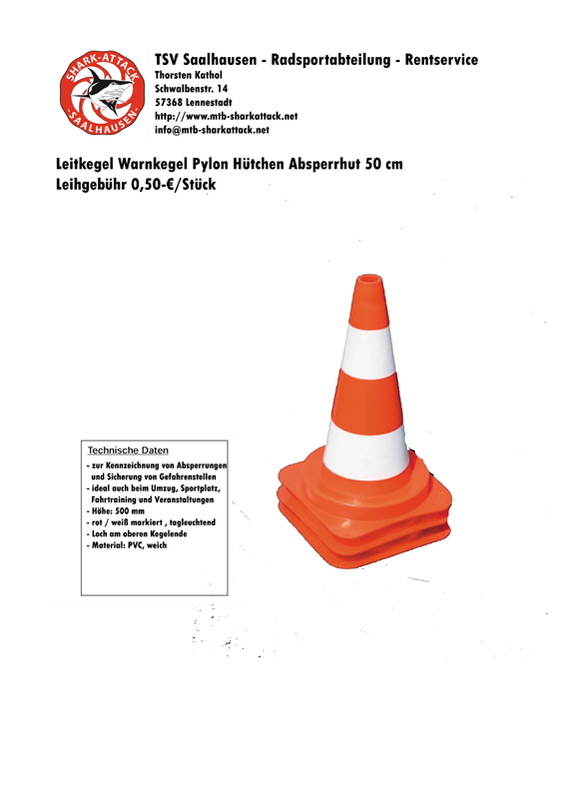 You will find changing rooms and sanitation in the Kur- und Bürgerhaus Saalhausen and next to it. There will be plenty to eat and drink. Please enjoy coffee, homemade cakes, pasta, French fries/chips and meat. There will be signs to find the feed and tech zones. Only in these zones, the athletes can be supported by their supporters. 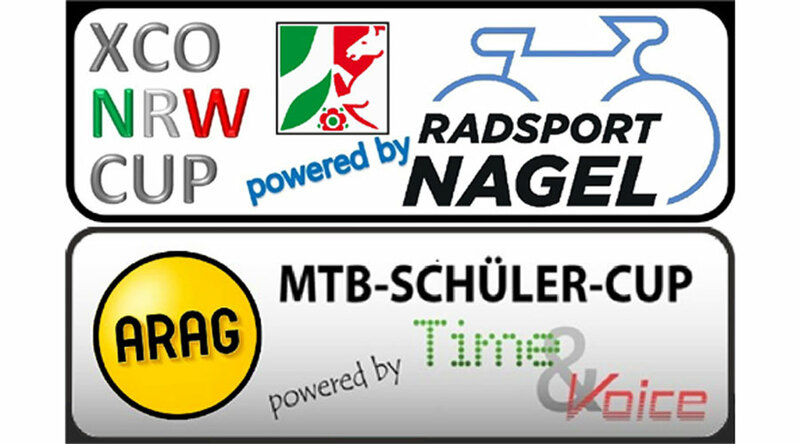 During the races in Saalhausen you will find double zones (Feed/Tech 1+2). Attention: the supporter license is obligatory! You always have to follow the instructions of the security service at the trails/Marshals. Should there be damage by not following their instructions, it will be at the expense of the person responsible for the damage. For security reasons please do not enter the single-trails if you are a spectator. Please take a look at the actual weather forecast for Lennestadt: www.Lennestadt-Wetter.de. Every athlete and viewer has to expect that there will be made some photos of herself/himself or her/his material, which may be published in the media. The XCO-trail mainly exists of forest tracks and single-trails. Distinctive route sections, like dogged rooty rises, an extreme uphill, a long fast downhill with some extras and the famous Tracto-Downhill provide a personal touch to this course. The circuit length for the young license drivers and the elite drivers is about 5,00 kilometers and has an altitude difference of 160 meters. The viewers can easily reach all interesting and spectacular spots in a few minutes. At the distinctive spots of the trail there will be checkpoints and disregarding rules or short-cuts will be transmitted to the race management immediately. These violations will be punished by disqualification at least. You always must follow the instructions of the marshals. Should there be damage by not following the instructions, it will be at the expense of the person responsible for the damage. For security reasons please do not enter the single-trails if you are a spectator. Athletes who cancel the race earlier have to sign off at the race management immediately. 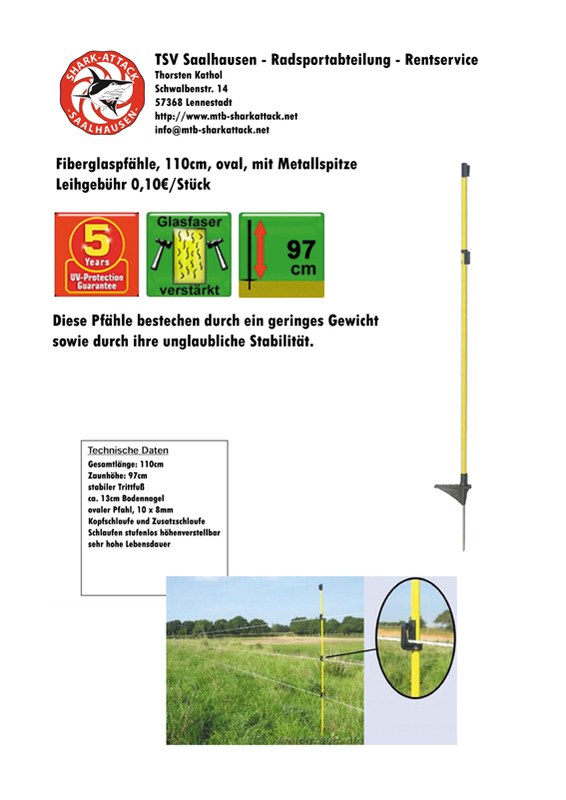 The punishment checklist according to Anhang C Wettkampfbestimmungen Mountainbike (Appendix C Competition Rules Mountainbike) is valid. The organizer is allowed to exclude athletes from the race or to punish them otherwise. This applies especially when there are breaches of rules, technical deficits, health risks or lack of sportsmanship. Wearing helmets is mandatory! Should there be breach of duties, either during training or race, the athlete can be disqualified. Every athlete has to be insured. The organizer or host does not assume liability for any damage. Please do not litter any material or waste next to the trails. 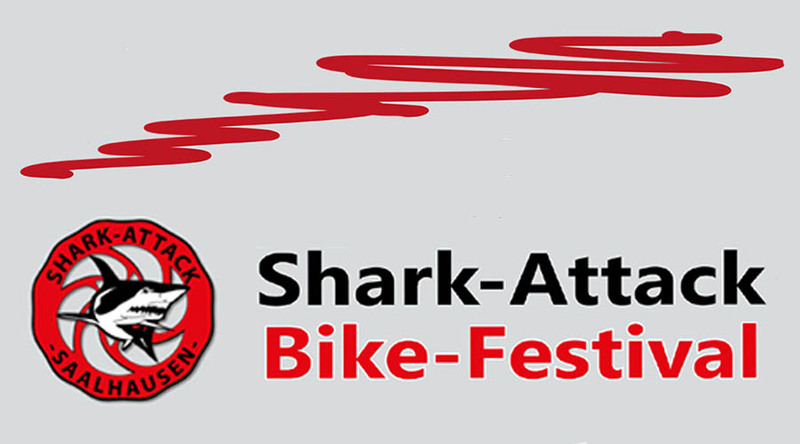 Have a lot of fun and a successful race at the Shark Attack Bike-Festival!